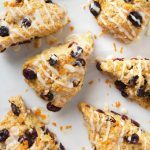 These raspberry scones are very lightly adapted from my favorite blueberry scones, but where I changed things up is in how I incorporated the fruit. For the blueberry scones, I mixed them straight into the dough and wasn’t gentle at all, which resulted in a lot of mashed berries (still delicious). For these scones, I divided the dough into four pieces, rolled each piece into an equal-sized round, and then added halved raspberries in between each layer of dough. From there, I formed all of the layers/filling into one round that I cut into scones. It worked out perfectly! 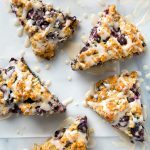 Since raspberries are more delicate than blueberries, this method helped to keep them from turning into mush and instead resulted in layers of extra flaky dough with juicy bites of raspberries throughout. Highly, highly recommended. 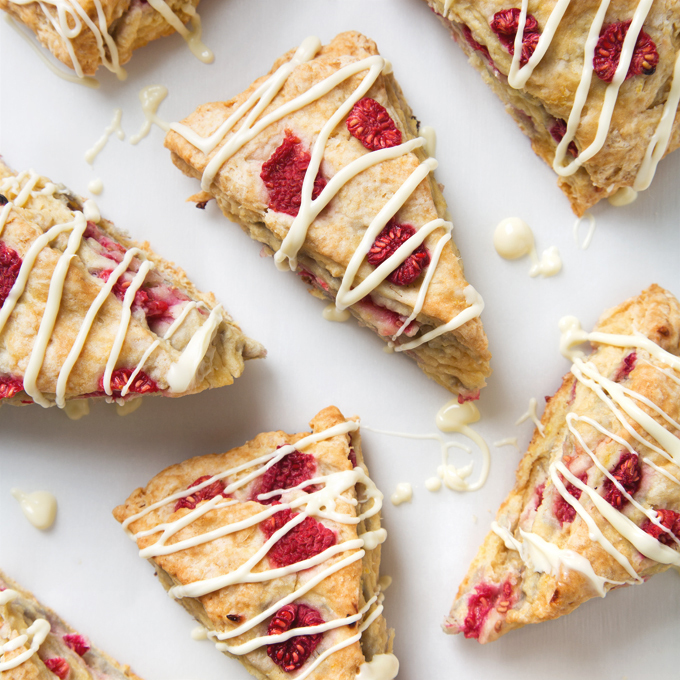 If you’ve ever felt intimidated by baking, these vegan raspberry scones are a great beginner recipe because they’re only 10 basic ingredients. You can mix them by hand and get in a decent arm workout, or do what I do and let your stand mixer (with the paddle attachment) do all of the heavy-lifting. They’re loaded with fresh raspberries, made with a small amount of buttery spread (coconut oil also works but I was going for a classic buttery vibe), scented with lemon zest and vanilla, and topped with a quick white chocolate drizzle to really make them next-level awesome. P.S. If you’re gluten-free, I’ve had good results swapping out the all-purpose flour for this gluten-free baking blend. 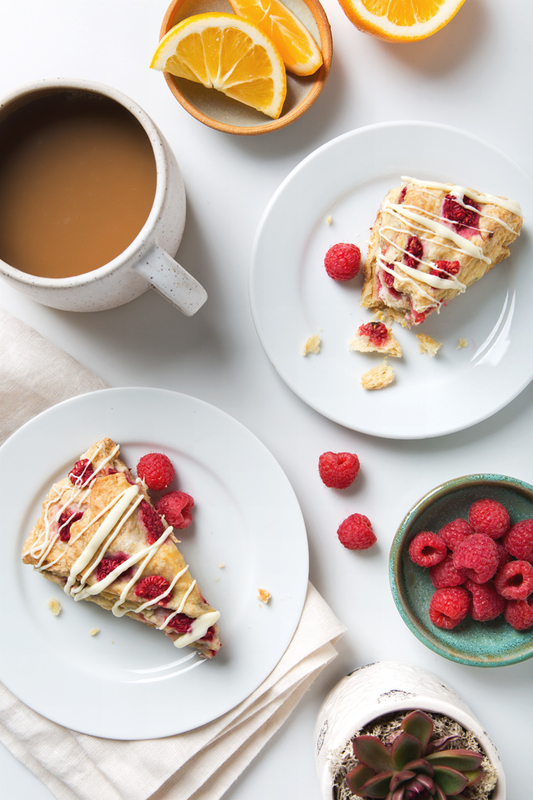 Simple vegan scones that are layered with juicy raspberries and scented with lemon and vanilla. They're topped with a dairy-free white chocolate drizzle—a great (easy!) recipe if you've ever felt intimidated about baking your own scones at home. Pre-heat the oven to 375° F. Line a baking sheet with parchment paper, lightly dust with flour, and set it aside. In the bowl of a stand mixer, use the paddle attachment to mix together the flour, baking powder, baking soda, and salt. Add the buttery spread pieces and mix on low-medium speed until well-incorporated (about 30 seconds). Make a well in the center and add in the vegan buttermilk, lemon zest, maple syrup, and vanilla. Mix until a slightly sticky, very thick dough forms. Be careful not to overwork the dough. Separate the dough into four pieces. Take the first piece and flatten the dough into a 6-inch round so that you can place ¼ of the raspberries on top. Take the second piece of dough and flatten it into an equal sized round and place the next ¼ of the raspberries on top. Repeat with the remaining dough and raspberries, but don't put the last ¼ of the raspberries on the very top yet. Use a rolling pin to gently form the layers into one 8-inch round, then use your hands to press the final ¼ of raspberries on top. Slice into 8 equal parts. Transfer the scones to the baking sheet, leaving space between each so all sides can brown. Bake for 25-30 minutes, or until golden and no longer doughy. Allow the scones to cool on the baking sheet for 10 minutes, then transfer them to a wire rack to cool completely. While the scones cool, make the white chocolate drizzle: Add the chocolate and coconut oil to a small microwave-safe bowl. Heat in 15 second increments, stirring between each, until the chocolate is melted. Use a spoon to drizzle over the scones. Serve immediately with melty chocolate, or allow to set for 5 minutes. To make this recipe gluten-free, replace the all-purpose flour with an equal amount of gluten-free baking blend. I really like this one from Bob's Red Mill. I find that using a stand mixer is easier and faster in terms of working the buttery spread into the flour mixture. It's a very dry dough and mixing by hand takes some elbow grease. I use and recommend a KitchenAid Stand Mixer. Feel free to replace the vegan white chocolate chips with chopped vegan white chocolate bars if those are easier to find near you. I usually order my white chocolate chips on Amazon. Solid coconut oil can be used instead of buttery spread, if you'd prefer. You'll want to cut it into pea-sized pieces to make sure it gets evenly incorporated when you mix it (I usually end up pinching it into the flour mixture). Recipe adapted from my Vegan Blueberry Scones. These look beautiful and I love that you included a gluten free option. No judgement from me on eating four either, I would have done the same girl! I’m glad I’m not alone on the scone eating front! I just couldn’t resist. So pretty! I’m going to have to try your layering method the next time I make scones because I always make such a giant mess of the fruit. Your dough looks flaky even though there’s much less butter than other recipes. Way to go! Pinned! Thanks, Katherine! I was so happy with how these turned out—even better than I expected. The layering method is the way to go! They look so good! Do you think they would work with strawberries? I have some that I need to use. I do! I would probably dice the strawberries. These look delicious Amanda! 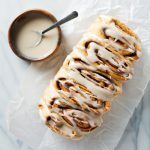 I would love to make these for my next brunch get together. I love raspberry! Oh wow. 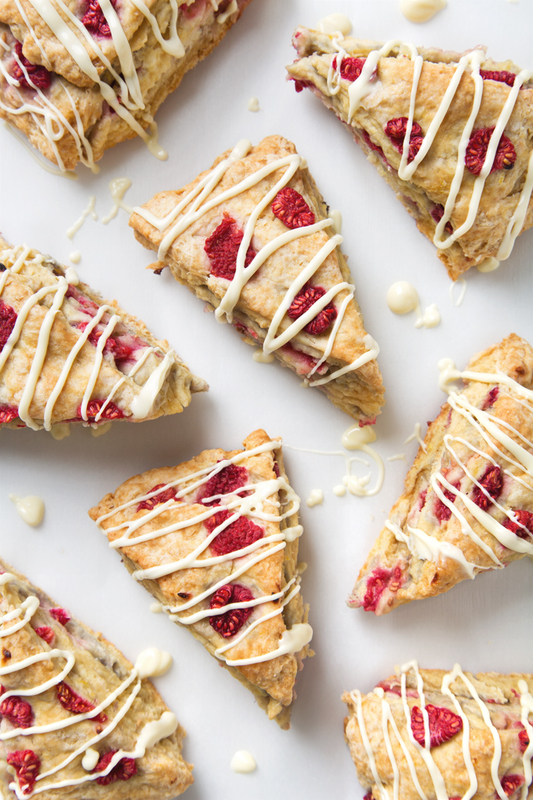 The white chocolate drizzle on these scones just takes them over the top. I can never find dairy-free white chocolate so I’m going to have to buy some of those white chocolate chips ASAP. 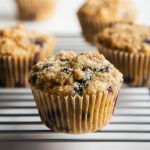 This is a berry delicious recipe! A: Why do elephants wear blue shoes? A: So they can hide in blueberry bushes. A: Have you ever seen an elephant in a blueberry bush?